*Can chickens take part in crime-solving? *Does the Oxford comma divide families? *Can Barb's heart be captured by a stray? *Will Faye ever see the value of dressing for success? *Has Retta figured out what she wants in a man? I just received final edits for SLEUTHING AT SWEET SPRINGS, so the next week should get me over the top. 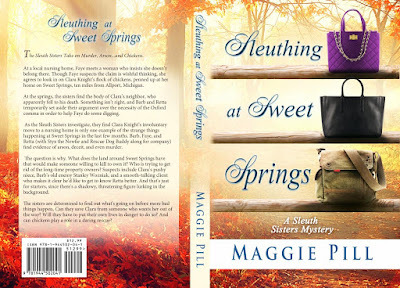 I'll be looking for beta readers, so let me know (maggie.pill@yahoo.com) if you'd like to get an early look! Release Day...What Did I Forget?